Cycling Maps || Ride Boldly! As a leader for the Twin Cities Bicycling Club, I used to lead a lot of rides around the metro. Then I had kids. This page holds some of my maps. These are provided solely for informational purpose, and I take no responsibility for any acts of county, state, or nature that may trash the roadways, take out bridges, or bring a rain of pea-gravel on any roadway described therein. They are old. I wouldn’t ride these without seriously checking out Google first. I should probably take some of these down, in fact. In other words: Use some sense and take some responsibility if you take one of these maps. Pain Machine (map – pdf) — A hilly ride in Saint Paul and Mendota Heights. Not for the faint of heart. Be polite when using the riverfront near downtown. Bop Til You Drop (2007) (map – jpg) (cue – pdf) — 2007 edition of the below, dealing with different construction issues. 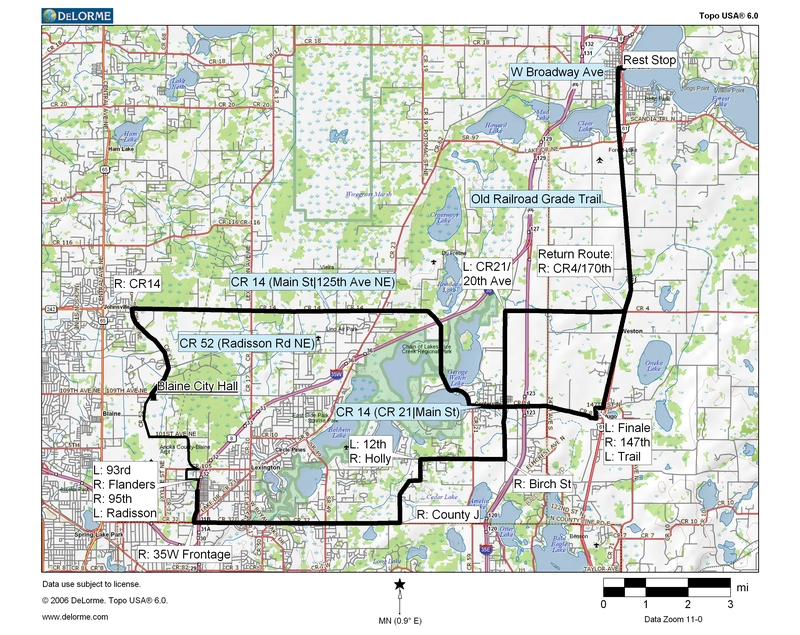 Chief differences are routing the 62 mile course via Lake Elmo and Stillwater, and the addition of a century loop. Bop Til You Drop (2006) (map – jpg) (cue – pdf) — 62/79/89 miles, from St. Paul, reaching as far east as Hudson, WI, on the longest route. Uses a slightly weird routing due to 2006-2007 Gateway Trail construction. Munchy Metric Hopkins 2007 (map – jpg) — 62ish miles from St. Paul to Hopkins and back, including the whole of the LRT East and Midtown Greenway. Avoids the State Fairgrounds. Munchy Metric Hopkins 2006 (map – pdf) (cue – pdf) — 62 miles from St. Paul to Hopkins and back, partly via the Cedar Lake Trail corridor. 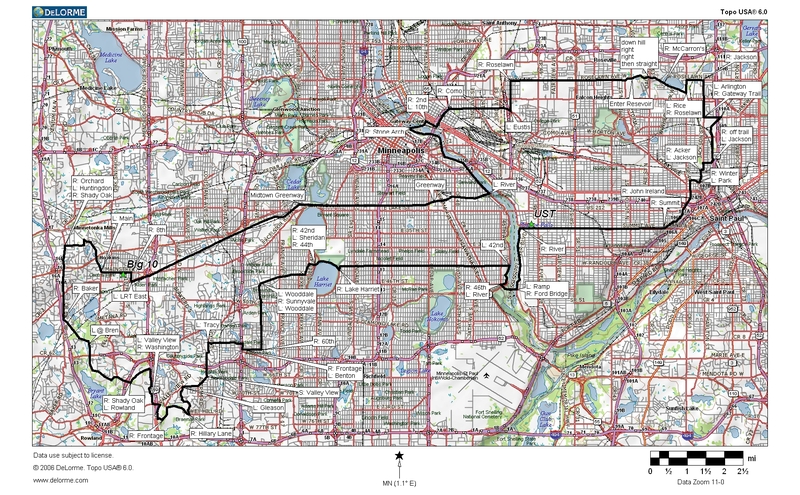 Great Googly Moogly I (map – pdf) — the classic version of this ride, going from St. Paul to Minneapolis, then north to the Roseville Rez, and back via the Gateway Trail and Summit Avenue. On Tuesday nights in summer, the Minnesota History Center has live music that’s worth a stop. Apple Orchard Ride 2006 (map – pdf) — 34 or 43 miles from White Bear Beach with a stop at an apple orchard (Pine Tree Apple Orchards). Short route uses Gateway Trail partway, long route opts for roads and rollers. Strawberry Fields Forever (map – pdf) — a ride completely unlike the above… eh, who’m I kidding. Same as above to Pine Tree Orchards, with a different start location due to seasonal use of the Beach lot by boat trailers, and the orchard has strawberries in late June/early July. Candy Apple Gray 2007 (map – pdf) (cue – pdf) — 35 miles from White Bear Beach with a stop at an apple orchard (Aamodt’s Apple Orchard). Mostly country roads with some rollers. Blitzkrieg Bop (map – pdf) (cue – pdf) — 34 or 45 miles from St. Paul into Dakota County. Camarillo Brillo (map – pdf) (cue – pdf) — 27/29 miles. The short-cut on the front-end avoids a warm-up hill. Ahem. Crazy Blaine Insane (map – jpg) — 49 miles. Cutoff probably takes off about 12 miles. Rest stop is Forest Lake Beach. Weekend on Wheels 2007 Saturday (map – jpg) (cue – pdf) 38 or 64 miles. Creative Commons Attribution-Noncommercial-Share Alike 3.0 United States License. This means that you can re-use this for non-commercial purposes with attribution — in other words, personal use. Obviously, this applies to the map files themselves.